In the future, any documentary on the life of a famous person will look a lot like Amy, director Asif Kapadia’s excellent biography of the late singer Amy Winehouse. Born in 1983, Winehouse’s brief years of fame occurred after the advent of ubiquitous handheld video cameras — and almost as soon as we got digital video recorders in our pockets, we started pointing them at celebrities. So nearly every significant moment in the life of Winehouse, who died in 2011 at age 27, was captured on film, from the recording of her most lasting songs to the depths of self-destruction. 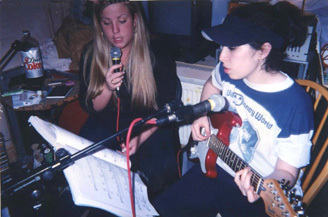 Amy is remarkably thorough and complete in the pursuit of its goal — which is to document Winehouse’s long, fatal journey into substance abuse. To be sure, Winehouse’s success, artistic brilliance and creative process are on the screen as well. But the subject matter here is the struggles with drugs, alcohol, eating disorders and poor associates that doomed Winehouse. Kapadia’s film opens with a teenage Winehouse finding success as a precocious jazz singer, playing bars and clubs and attracting significant attention from the fringes of the music industry as she begins to contemplate recording a debut album. All is sunny until that record, Frank, debuts; nearly as soon as it establishes her celebrity, darkness begins creeping in. The audience shouldn’t be surprised; Winehouse predicts the outcome herself early in the film, candidly speculating that she isn’t equipped for fame. Her personal life and relationships are of more interest to Kapadia than her work, though several sequences of Winehouse writing and performing — often accompanied by on-screen renderings of her lyrics — understatedly illuminate her considerable songwriting prowess. Much of the film’s middle act, though, is concerned with those closest to Amy — her ex-husband Blake Fielder-Civil, her father Mitch Winehouse, her manager Raye Cosbert — and the things they did not do that might’ve led to a different outcome. A sense of inevitability hangs over the film, and not merely because the audience knows what happens at the end; Kapadia’s great skill is constructing a narrative with its own gravity out of a collage of source material. Jarringly, Amy ends mere seconds after the circumstances of her death are briefly discussed. It’s an abrupt conclusion to a lengthy movie, but the meaning in this move is clear; when a 27-year-old superstar dies, there is much that will never be said.